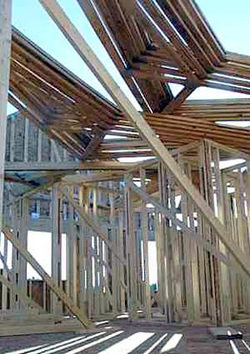 1) Trusses are incredibly strong. 2) Because they are built strictly from shorter lengths of 2x4 lumber, they are generally a lot less expensive than the alternative. 3) You can have just about any shape custom-built, and this allows interesting features like cathedral ceilings at low cost. 4) You can span a large distance with a truss and the truss transmits all of the weight to the exterior walls. Therefore, none of the interior walls are "load-bearing," so they can go anywhere and are easily moved later. 5) Trusses go up quickly! 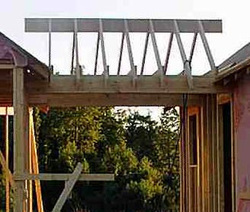 Gable trusses are used at the ends of the roof (the outermost trusses on either end). The vertical pieces are 16 inches on center so that siding can be nailed on. The left-hand side will provide a cathedral ceiling over the living room. 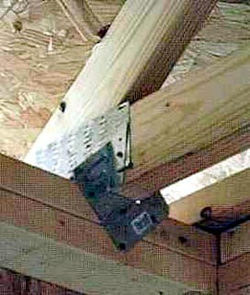 Scissors trusses are used for the front room, and M trusses are used over the garage. 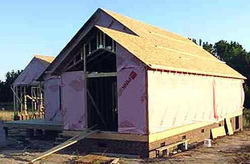 Gable trusses are used at the ends of the three rooflines. The trusses are fist stacked on top of the walls, either by hand or with a crane. These trusses went up in about four hours. They are on 24-inch centers. 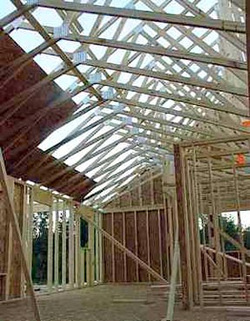 Once the trusses are up, the roof is covered in plywood or OSB, which gives the roof tremendous rigidity. There are two small custom roofs in this house: the roof over the porch and the roof over the breezeway. 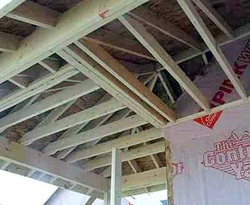 Roof framing without trusses is actually fairly complicated. The angles found in anything but the simplest roof become intricate.